COLOR PREP: Disperse 1 teaspoon Chrome Green Oxide in 1 tablespoon of sunflower or sweet almond oil (or any other liquid oil). Have the Gold Sparkle Mica close by to use in between all the layers. TWO: Melt and combine the coconut oil, shea butter, olive oil, rice bran oil and avocado oil. Pour the oils into your Crock Pot pot. Slowly add the lye water to the oils. 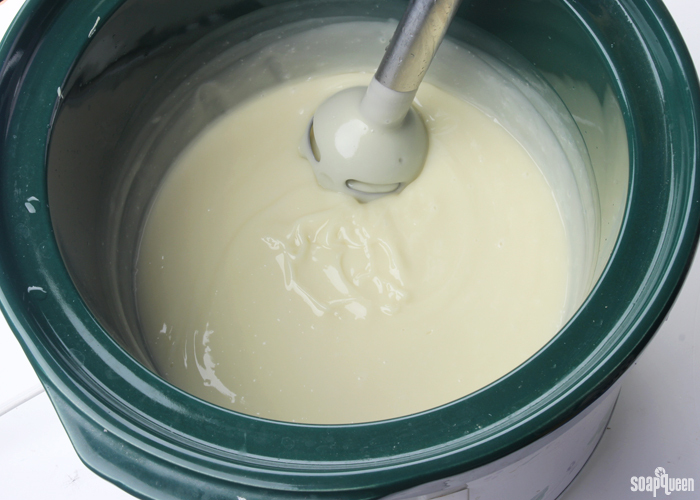 Make sure the mixture does not fill up more than half of the crock pot or cooking vessel. FOUR: Put the lid on the crock pot and set it to low. After 15 minutes, check the soap to see the progress made. Starting from the outside, the texture and color of the soap will start to change into a glossy, slightly Vaseline-like texture. If the middle does not appear to be changing, stir the batch to ensure even cooking. Don’t be surprised if the soap starts to grow in volume. Do not leave your soap unattended in the first 30 minutes of cook time for this reason. If the soap gets too high in the pot, wearing gloves, take the pot off heat and stir like crazy. FIVE: The batch will be ready when it’s the texture of glossy, thin mashed potatoes. This may take another 15 minute session or even two or three more stir’n’waits. When you think it’s ready, use a pH strip to test the levels. It should be showing below a 10. Be sure not to overcook the soap; you don’t want too dry a texture for the next steps! NOTE: The amount of time that the soap takes in the Crock Pot phase can depend on the size and shape of your Crock Pot. The flatter ones meant for roasts may go a bit quicker because the soap will be spread out thinner on the heated surface. Because this is a small batch of soap, you may find it will cook faster than larger batches. For our standard sized Crock Pot, the soap took approximately 30 minutes to cook. SIX: When the soap is ready, add the Kentish Rain fragrance oil blend and mix well. Turn the crock pot off. SEVEN: Spoon out about 300 mL of soap into a container, and add 2 tsp. of dispersed Chrome Green Oxide. Use a spoon or spatula to mix in the color thoroughly. 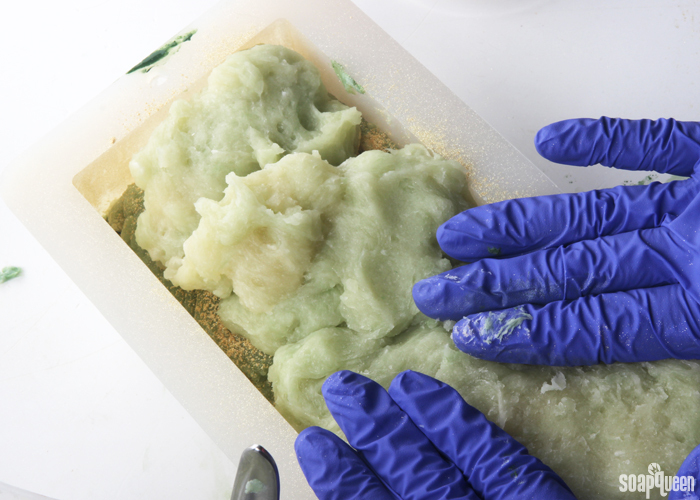 EIGHT: Transfer the green soap into the mold, and tap the mold firmly on the counter to evenly distribute. 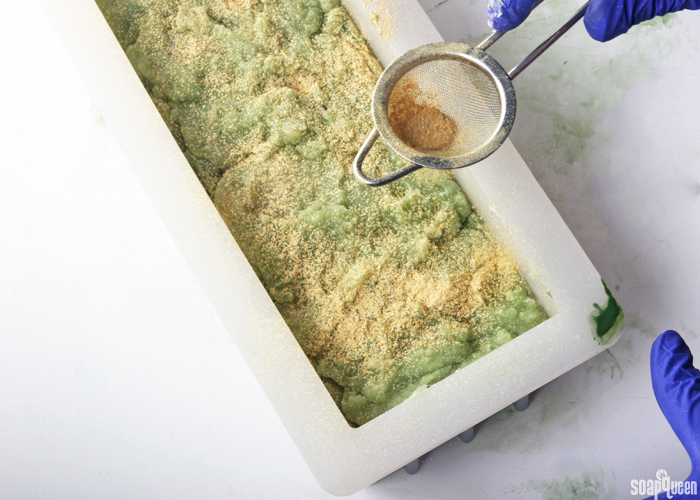 Tap a small amount of Sparkle Gold Mica into the powder duster, and sprinkle the gold mica onto the green soap evenly. Only apply a thing layer; if too much mica is used the layers may separate. NINE: Scoop out another 300 mL of soap into a separate container and add 1/2 tsp. dispersed Chrome Green Oxide. Stir in the color thoroughly. Plop the soap on top of the first layer. Placing the soap into different areas of the mold makes it easier to evenly distribute the soap. Gently use a spoon or spatula to gently spread the soap. You can also use your gloved hands to gently spread the soap, but be careful as it may be hot to the touch. Tap the mold firmly onto the counter to help spread the soap evenly. TEN: Use the powder duster to create a thin layer of mica on top of the second layer. ELEVEN: Scoop out approximately 300 mL of soap and add 1/4 tsp. dispersed Chrome Green Oxide. Stir in the color thoroughly. Layer the soap into the mold, using the same method as in step nine. Use the powder duster to create a thing layer of mica on top of the third layer. 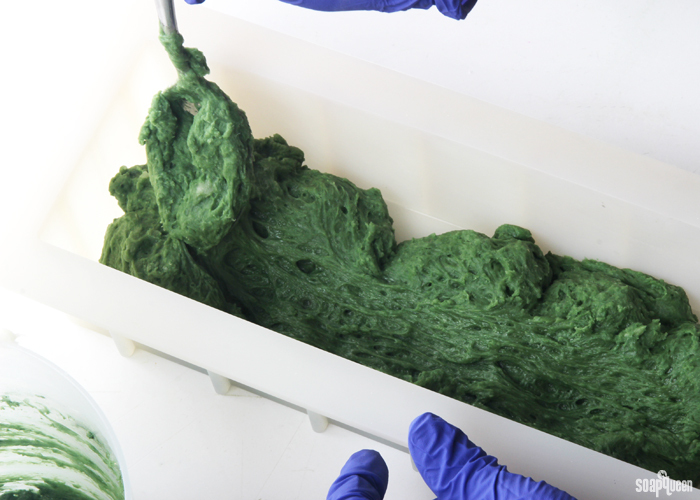 TWELVE: Scoop out the remaining soap and add 1/8 tsp of dispersed Chrome Green Oxide. Stir in the color thoroughly. Layer the soap into the mold, using the same method as in step nine. For this layer, you may find it helpful to gently press the soap with your hands to create a more even top. Tap the mold firmly on the counter, and use the powder duster to top the soap with a thin dusting of gold mica. 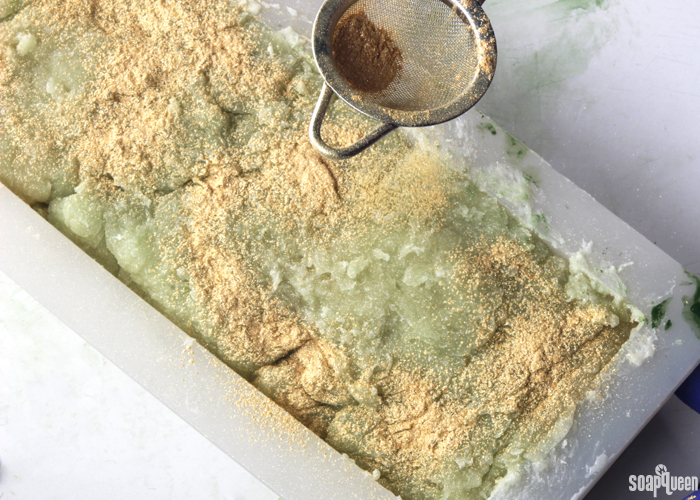 THIRTEEN: Allow the soap to harden in the mold for 1-2 days. Unmold and cut. This soap is ready to use right away but will last longer in the shower after a full 4-6 week dry and evaporation time. Looking for even more St. Patrick’s Day projects? Check out these green tutorials below! Made with layers of green ombre and plenty of gold shimmer, this Luck of the Irish Hot Process is perfect for St. Patrick's Day! COLOR PREP: Disperse 1 teaspoon Chrome Green Oxide in 1 tablespoon of sunflower or sweet almond oil (or any other liquid oil). Have the Gold Sparkle Mica handy to use in between all the layers. Slowly and carefully add the lye to the water and gently stir until the lye has fully dissolved and the liquid is clear. Set aside to cool. Once cooled, add sodium lactate. Sodium lactate is used in hot process at 3% of the oil weight to help produce a smoother bar. Melt and combine the coconut oil, shea butter, olive oil, rice bran oil and avocado oil. Pour the oils into your Crock Pot’s pot. Slowly add the lye water to the oils. Put the lid on the Crock Pot and set it to low. After 15 minutes, check the soap to see the progress made. Starting from the outside, the texture and color of the soap will start to change into a glossy, slightly vaseline-like texture. If the middle does not appear to be changing, stir the batch to ensure even cooking. Don’t be surprised if the soap starts to grow in volume. Do not leave your soap unattended in the first 30 minutes of cook time for this reason. If the soap gets too high in the pot, take the pot off heat and stir like crazy. The batch will be ready when it’s the texture of glossy mashed potatoes. This may take another 15 minute session or even two or three more stir’n’waits. When you think it’s ready, use a pH strip to test the levels. It should be showing below a 10. Be sure not to overcook the soap; you don’t want too dry a texture for the next steps! 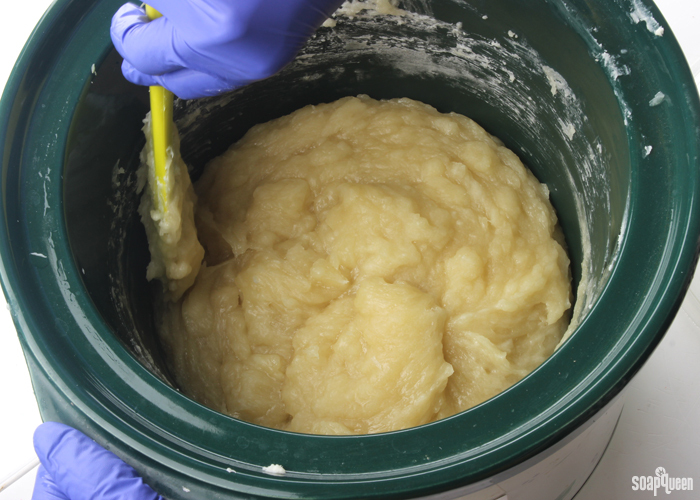 The amount of time that the soap takes in the Crock Pot phase can depend on the size and shape of your Crock Pot. The flatter ones meant for roasts may go a bit quicker because the soap will be spread out thinner on the heated surface. Because this is a small batch of soap, you may find it will cook faster than larger batches. For our standard sized Crock Pot, the soap took approximately 30 minutes to cook. When the soap is ready, add the Kentish Rain fragrance oil blend and mix well. Turn the crock pot off. Spoon out about 300 mL of soap into a container, and add 2 tsp. of dispersed Chrome Green Oxide. Use a spoon or spatula to mix in the color thoroughly. 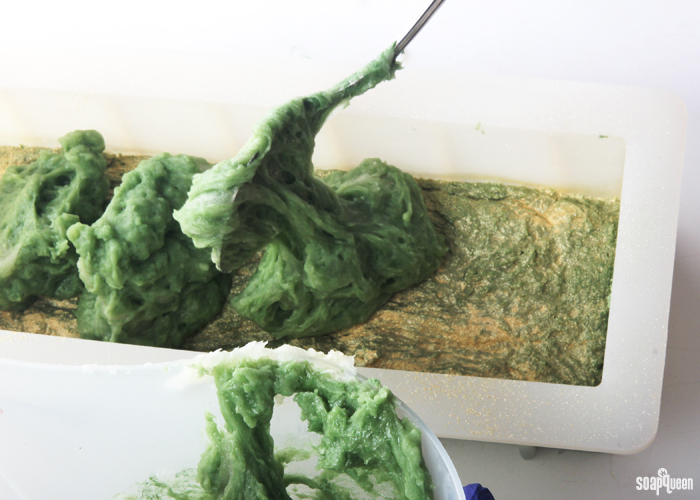 Transfer the green soap into the mold, and tap the mold firmly on the counter to evenly distribute. 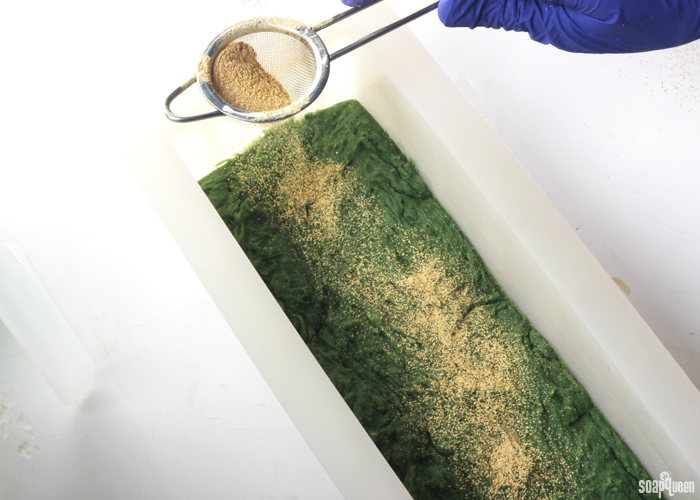 Tap a small amount of Sparkle Gold Mica into the powder duster, and sprinkle the gold mica onto the green soap evenly. Only apply a thing layer; if too much mica is used the layers may separate. Scoop out another 300 mL of soap into a separate container and add ½ tsp. dispersed Chrome Green Oxide. Stir in the color thoroughly. Plop the soap on top of the first layer. Placing the soap into different areas of the mold makes it easier to evenly distribute the soap. Gently use a spoon or spatula to gently spread the soap. You can also use your gloved hands to gently spread the soap, but be careful as it may be hot to the touch. Tap the mold firmly onto the counter to help spread the soap evenly. Use the powder duster to create a thin layer of mica on top of the second layer. Scoop out approximately 300 mL of soap and add ¼ tsp. dispersed Chrome Green Oxide. Stir in the color thoroughly. Layer the soap into the mold, using the same method as in step nine. Use the powder duster to create a thing layer of mica on top of the third layer. 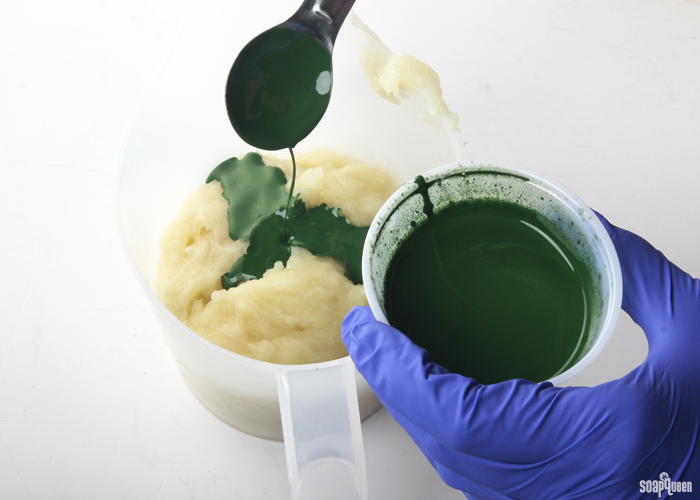 Scoop out the remaining soap and add ⅛ tsp of dispersed Chrome Green Oxide. Stir in the color thoroughly. Layer the soap into the mold, using the same method as in step nine. For this layer, you may find it helpful to gently press the soap with your hands to create a more even top. Tap the mold firmly on the counter, and use the powder duster to top the soap with a thin dusting of gold mica. Allow the soap to harden in the mold for 1-2 days. Unmold and cut. This soap is ready to use right away but will last longer in the shower after a full 4-6 week drying time. Hello, what size of crockpot should I be using? Thanks! I made this soap as a cold process soap with lavender essential oil and lavender oxide instead of the gree. I also took out ricebran oil and added a bit of castor oil and increased olive and coconut oil (did i get carried away). Anyways, it came out really soft…i did run it through the soap calculator and it came ok….should i just wait longer? I unmolded it and had to “glue”some of the pieces that came off back on. Can you think of anything that I did wrong! I am perplexed…. 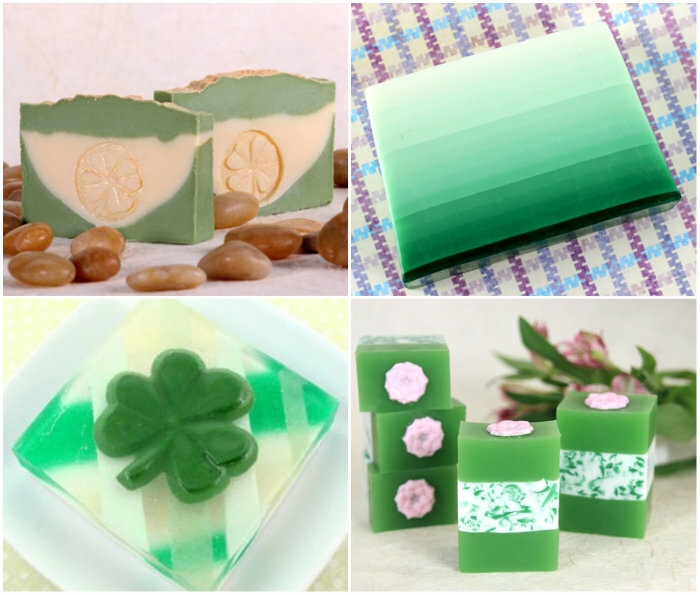 Kelsey, I am trying to make this soap Luck of the Irish with the Kentish Rain but she did not mention now much oil she mixed with the green. Can that be extra oil, or does it have to be a superfatting oil? Oh whoops, that should be 1 teaspoon of Chrome Green Oxide in 1 tablespoon of a lightweight oil. Sorry about that Betty! I updated the post with the oil amount. For the measurements listed in ounces, is that ounces by weight or volume? What would be a good sub. for the shea butter? I am allergic to it. :/ other than that what a great recipe! i recently found out i have Irish ancestry and this will be perfect for this new Irish girl haha. Another HP soap question sorry! I made another batch of HP soap yesterday. The batch looked great but my essential oils were pretty much non existent. I created a mix of Basil, Bergamot, Litsea and Lavender. The only scent that came through was Basil EO. I used the BB calculator to get the EO calculations right, so I know it isn’t that I added too little. I was wondering if you have any tips for successfully adding oils like Bergamot to HP soap? It’s totally fine, we are here to help! If those scents are still faint, you can tweak your scent ratio a bit. Basil Essential Oil is super strong and tends to take over all the other scents. Adding less can help those other scents shine through. Also, soap hot process soapers like to use high flash point oils, or add the fragrance when the soap is cooler. The flash point is the temperature at which, under certain circumstances, the liquid in question can ignite with a flame. This means the liquid needs to be at the flash point temperature and come in contact with an open flame. Some people believe if a scent is heated to the flash point temperature in recipes, it can cause the fragrance to fade. 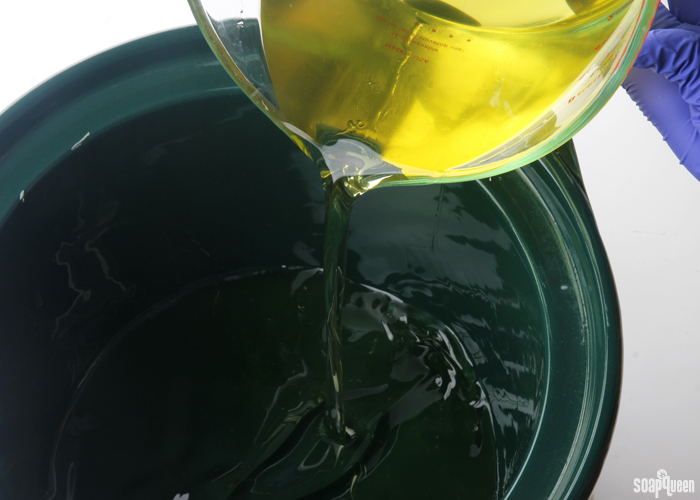 The shelf life of hot process will be the same as cold process soap – it depends on the oils you use! So, if your batch has fresh oils with shelf lives of a year or so, the soap will last about a year or so. To prolong that shelf life, we recommend letting the soap cure 2 weeks or so. Although most of the water is cooked out, a tiny amount is leftover afterward. Giving the soap those extra couple of weeks helps everything evaporate fully, giving you long lasting bars. With the yogurt or coconut milk, I have the same worry you do. Because the soap is almost finished saponifying, the milk may not get turned into soap. It would be similar to leaving a carton of milk at room temperature, and would cut that shelf life down to just a couple of weeks (a bit longer in the fridge). Thanks so much Kelsey. The knowledge of the Brambleberry team is amazing. I think I will leave the milk out and go with the sodium lactate. I think your method of calculation should work out just fine. Running the recipe through the Lye Calculator at 0% then working out the 5% superfat may not be exactly spot on with the superfat calculation, but will be really close. As someone who is also terrible at math, I think it’s a great idea! Can I use your “Lots of Lather” quick mix in hot process? 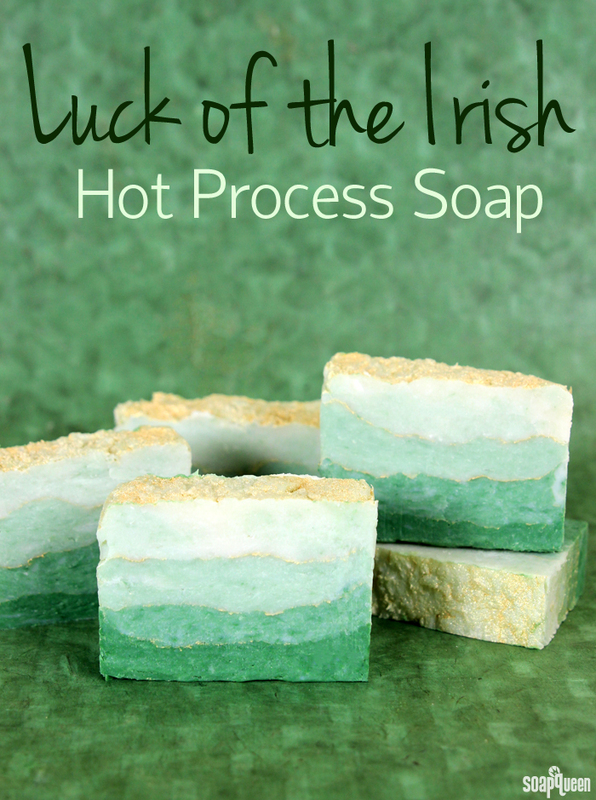 Can I use a cold process soap receipe but use Hot Process technique to make it? Absolutely! Cold process recipes can definitely be converted into hot process recipes. Just keep in mind that hot process recipes are fairly thick, so swirly designs will look different. Hmm, that’s strange! Can you tell me a bit more about your recipe, including the ingredients you used and the temperatures you soap at? Also, what is the temperature of the oven when you’re CPOPing? I usually soap at around 80 degrees sometimes lower, and I turn my oven on 170, put the soap in for around 30 minutes (any longer is too long and I get bubbles on top) I turn the oven off, sometimes I will leave it in there to sleep, sometimes I will take it out. My soap gels beautifully, not all soaps come out with tacky tops. Like I said, the bar it’s self on the sides and bottoms are very nice and dry, but the tops for the most part are staying sticky. Thank you for any help, and I understand if it is a complete mystery to you too. Thank you soooo much, I’m going to reduce the amount of castor oil and see if that works, and it makes perfect sense that maybe the tacky ones are going through a super hot gel phase…that along with too much castor oil…you’re awesome!! <3 Thanks!!!! I just made this soap and unmolded it. It smells amazing and looks great. I am new to soap making, so I am impressed with myself on this one. The problem is that the layers did not stick together. I don’t think I used too much mica. Is there a way to fix this at this point? Someway to get the layers to stick together? I don’t want to waste the whole brick of soap. Typically, the mica is responsible for causing those layers to separate. However, if the soap is on the dry side or cools off too quickly, that can cause separation as well. 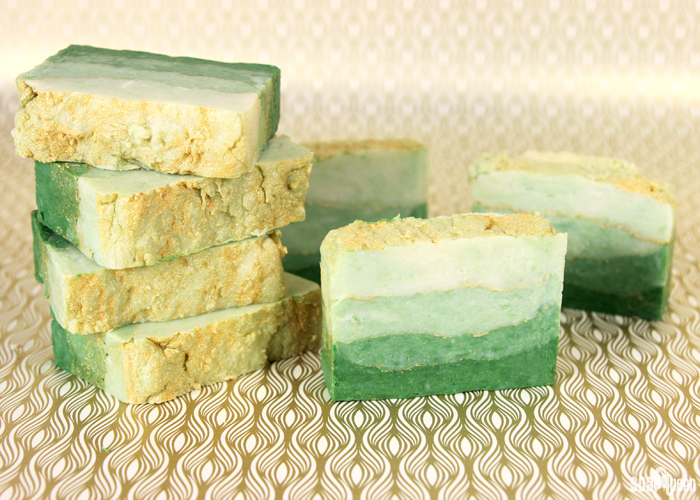 To make those layers stick together, cook the soap until your pH strips show a 10 or below. Then, turn your Crock Pot off. 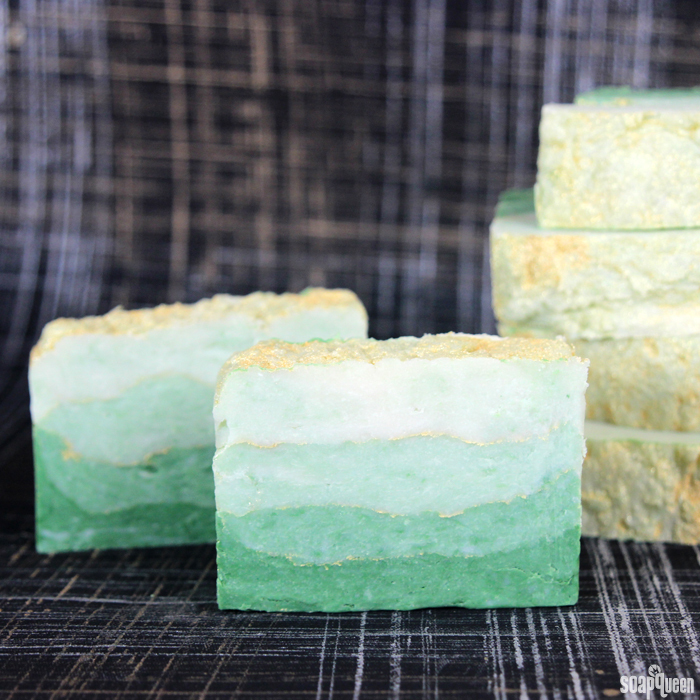 Also, you can rebatch this soap if you like! It will lose the layered look, but you’ll still be able to use the bars of soap. Just made this yesterday and absolutely love the look and smell of it. I’m relatively new to soap making, but found this recipe fairly easy to follow. It is also the first time I’ve added Shea butter to a soap recipe and I love the properties it adds. I’m definitely going to use this recipe again! Thank you! Can this recipe be used with cold process? Does anything in the recipe (oil, water, lye) need to be changed to use it for cold process? I made this soap 2 days ago and unmolded yesterday. I did it cold process though, not HP. And the only other changes were that I used liquid chlorophyll for the color and not oxide, and I used Bay, Basil, Rosemary and Cedar EOs for scent, and I used 2 tsp of Sodium Lactate, not 1 oz. Soaped at 125 degrees. Well, somehow it turned out lye heavy!! My strip is showing 13!! My other soap I made the day before that is at 8. I have no idea what happened. I’m sure I followed everything exactly, and this was my 25th batch. First time that this happened. I don’t know if I should let it sit longer or do hot hero. It also has a partial gel, but doesn’t look too bad. It is also developing ash on the cut sides, on the bottom, where it is ungeled! Oh, and by the way, it still looks absolutely gorgeous!! Oh, and I hate it when something happens on the weekend, and then we have to wait until Monday for the response. If your soap is still lye heavy, it’s most likely due to mis-measurement – forgetting an oil, or accidentally adding too much lye somehow. If your soap really is at 13 pH and you JUST made it, you can try to Hot Process Hero it out http://www.soapqueen.com/bath-and-body-tutorials/tips-and-tricks/hot-process-hero-2/ and add at least 4 to 8 ounces of a new liquid oil. This will make your recipe fairly superfatted but at least you’ll be able to use it. It’s either that or grating up for laundry soap – http://www.soapqueen.com/bath-and-body-tutorials/home-crafts/three-diy-laundry-soap-recipes/ – as you (sadly) know, you cannot use soap that has a pH of 13 on your skin (or anyone elses). So these are some ideas for how to salvage this recipe. Please come back and keep me posted on how it goes? I’m very curious! Thank you so much for a speedy response!! I retested again with strips and distilled water and it went down to 8! It was definitely at 13 yesterday (that dark burgundy color on the chart), so it must have not finished saponification. I knew I should have waited another day, especially since it is Palm free. It doesn’t zap anymore either. Still has that ash, just on the bottom, where it didn’t gel. I wonder if I left it longer in the mold, if it wouldn’t have ashed either. And I was wondering if I could have just rebatched later and added more oils, instead of just laundry soap? It was too late for Hero, and it wasn’t a gloppy mess anyway, it’s really nice, and smells great. I’ll send you an email with a picture. Also, I’m so glad that soap turned out well for you! If it looks great and isn’t lye heavy, you can definitely use it. Did you notice that ash on the bottom? Isn’t it weird that it’s just on the bottom, on the ungelled part?? Even though the gelling is not too noticeable, it did go just through partial gel. It looks like it may be soda ash. Soda ash forms when unsaponified lye reacts with naturally occurring carbon dioxide in the air. It typically happens on the top of your bars, but can occur anywhere the bars are exposed to air. This is gorgeous! I’m getting a little addicted to veining in HP, since I’ve gotten compliments on my coconut oil bars with charcoal veins. There seem to be so much literature and examples of CP, and considerably very few of HP (not just on SQ, but other places too). Is that because of the “rustic” look being less appealing to some people, or is HP regarded as more difficult? Or is CP just more fun (I’ve never done it)? Can’t wait to try some gold mica veins! 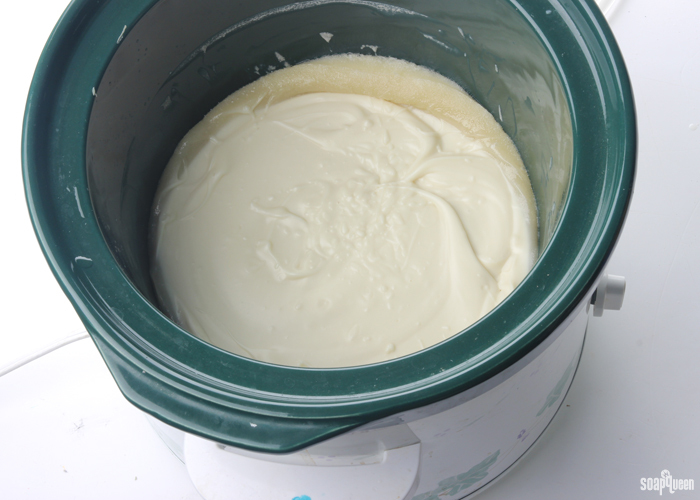 What size crockpot did you use (or would you recommend) for this recipe? Thank you! Hi, sorry for the newbie-to-hot-process question. When you say let the lye cool, to what temperature might that be? And what should the oils’ temperature be? Thank you! Would you just add more olive oil then? Since the recipe already has olive oil in it? Or would the whole formula have to be changed? My daughter and I just made a batch of hot process soap this evening. Her first and my second. During a break I opened my computer and saw this post. What beautiful bars! We already love cold process and are now getting into hot process. I’d love to see more recipes. Thanks for this one!! Well the 1lb rice bran oil is out of stock. What can be used instead of rice bran oil for that part of the recipe? (Didn’t want to buy the 7lb and have it sit around) Thanks. You can use olive oil as a replacement. I love the vibrant colors of this soap, but I was wondering after I ran it through your soap calc what superfat % is this recipe? It seems to be between 3%-4%. 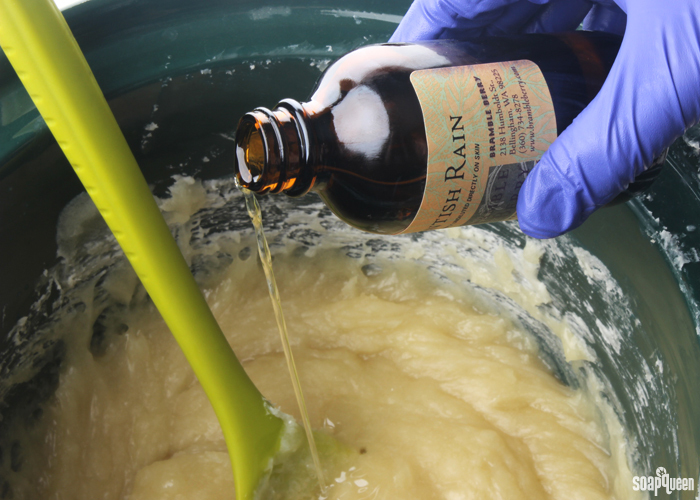 Ever since I tried a lotion recipe with rice bran oil, it is one of my go to oils. Can’t wait to try this recipe!